We are passionate about the learning experience. We are always looking for new and innovative ways to connect science, technology, engineering, arts, and maths. We work with all ages, at every eductional level. We offer workshops that give learners an opportunity to make, build, create and explore. Each session is hands-on, working in teams to solve problems, using design and creativity to find new solutions. We encourage every participant to take greater responsibility for their own learning, finding his or her own answers to questions that arise. An introduction to design and interactive technology, MaKey MaKey. Learn about conductive materials and how these materials can be used creatively to design and make musical instruments. This workshop can be run with any age group, as a 2 or 3 hour session, or as a full day workshop. An introduction to circuitry, soldering and PCBs, for anyone interested in sound, music and prototyping. Your finished piece can be plugged into your phone or an electric instrument. This workshop can be run with 12+ age group, as a 3 hour session, or as a full day workshop. If you would like to discuss and/or book this workshop with us click here. Are you looking for creative ways to connect Science, Technology, Engineering, Arts, and Maths (STEAM) subjects? This is an introductory workshop to electronics for creative projects in the classroom, makerspace, or art space. This is an adult 2 day workshop but can be run over 1 day or as a 6/12 week course. Practice basic coding skills with Scratch, used along with a MaKey MaKey to trigger the coded functions using real-world objects. Design and make a collection of imaginative tools that create beautiful computer generated art, ranging from cartoons to abstract glitch-scapes. This workshop can be run with 10+ age group, as a 3 hour session, or as a full day workshop. A great workshop to combine craft and design with LEDs. Also, a wonderful introduction to soldering. You will be introduced to crafting, design, circuitry and how to work with electronic components such as LEDs, resistors, batteries and conductive tape to make a light box. This workshop can be run with 10+ age group, as a 2/3 hour session, or as a full day workshop. Learn about electronics and how circuits can be used to power a gear motor. Design and build a Scribble Bot that makes art. And/or learn about gears and pulleys when designing and building a carousel which plays sound. This workshop can be run with any age group, as a 1.5 hour session (Scribble Bot), or as a full day workshop (Carousel), or as a 6/12 week course (Robotics). You will work in small groups to create original game designs with conductive features to generate audio instructions, sound effects and scoring. This workshop motivates participants to consider the ethics behind game rules and use creative skills to invent a new game prototype that has never been played before. You will learn the basics of circuitry before being introduced to micro-controllers and how they can control sensors and LEDs. This workshop is a great introduction to electronics and coding as well as an exploration on how creativity can be incorporated to make a piece of wearable technology. This workshop can be run with 10+ age group, as a 3 hour session, as a full day workshop or as a 6 week course. This workshop is great for youngsters interested in being creative with circuits using conductive clay. Perfect for primary age groups and/or as a basic introduction to electronics using malleable materials for older age groups, including adults. This workshop is usually a 1 hour session. This workshop focuses on the material found in the humble pencil: graphite. You will explore its property as a conductive medium for electricity and its potential to trigger senses other than the visual in drawings that we make interactive simply and quickly. This 1-2 hour workshop can be run with any age group. Using Sonic Pi software, you will learn coding basics in order to make sound.You will compose beats with a baseline, along with other melodies to create a finished loop! This workshop can be run with 10+ age group, as a 3 hour session, a full day workshop or as a 6/12 week course. 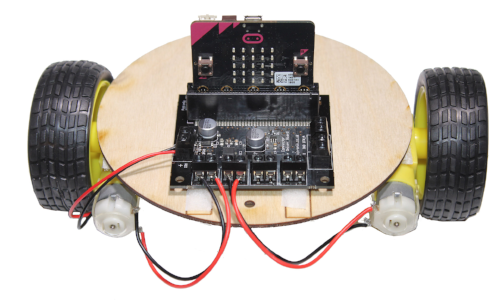 Learn about the BBC micro:bit and how it can be used to program a robot using MakeCode. In this workshop you will build a robot and gain an understanding about how radio signals and accelerometers can be used to control it. This workshop can be run with 8+ age group, as a 3 hour session, a full day workshop or as a 6/12 week course. Our favourite time of the year to try out our newly designed workshops with schools and makerspaces we visit around Ireland. New workshops include wearable technology, robotics and interactive design. Sessions can be 1 - 3 hours long, or as full day workshops. See past events to get a taste of some workshops and events we have delivered to date. If you would like to book a workshop with us during Tech Week click here. At Make Create Innovate, we are always looking out for ways to make coding practical, engaging, creative and fun. Our workshops exploring creativity and code can be focused on music, art, sound and wearable technology, depending on the needs and interests of the group we are working with. If you would like to book a workshop with us during Code Week click here. As the panning for Science Week approaches, we are delighted to be spending time with many schools and makerspaces around Ireland in November, as always, having fun with electricity and creativity. If you would like to book a workshop with us during Science Week click here.